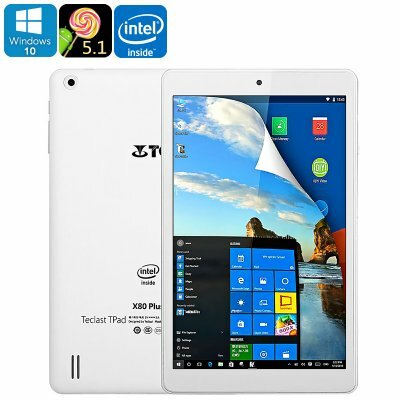 Successfully Added Teclast X80 Plus Tablet PC - Windows 10, Android 5.1, Quad-Core CPU, Google Play, HDMI Out, 8-Inch Display, 2GB RAM to your Shopping Cart. Featuring Windows 10 and Android 5.1, the Teclast X80 Plus is a Dual-OS tablet PC that is perfect for all tech lovers out there that simply can not choose between a high-end Android or Windows device. By supporting two operating systems, this tablet computer allows you to enjoy an abundance of the latest features the mobile industry has to offer. Whether you use Windows 10 for playing games, writing documents, or browsing the web, or are using Android 5.1 to enjoy the latest Android applications and games that can be downloaded via the Play Store – the Teclast X80 Plus is guaranteed to deliver a smooth user experience that is sure to meet the liking of anybody out there. Thanks to the epic Intel Atom X5-Z8350 processor that reaches speeds up to 1.92GHz, this powerful Dual-OS tablet computer is capable of dealing with the most demanding of software – letting you enjoy the latest games and applications without dropping a frame. Built to deliver a powerful and energy efficient user experience, this Quad-Core CPU along with 2GB of RAM is guaranteed to handle whatever you throw at it without you needing to worry about slowing down your device. Whether you’re into online gaming, like to watch a movie online, or simply use this tablet PC to browse the web or to make notes in class, the Teclast X80 Plus will provide you with a top-class experience. On its stunning 8-Inch IPS display, this dual-OS tablet PC portraits all your favorite media in great detail and vivid color - allowing you to take your mobile entertainment experience to entirely new heights. Supporting up to 128GB of external storage, the Teclast X80 Plus holds oceans of space for you to store all your media, files, and mobile games. From now on there will never be a reason to be bored again as, with this Dual-OS tablet at your side, you’ll always have the capacity to carry along a years’ worth of mobile entertainment at all time. Along with its 3800mAh battery, you will be able to enjoy all your favorite media, write up files, or simply browse the web for numerous hours in a row – getting you through the most demanding of days without needing to worry about battery life. Featuring a micro HDMI port, this Dual-OS tablet computer lets you conveniently hook it up to your television or computer - allowing you to enjoy all the amazing Android and Windows features this tablet PC has to offer on your big screen TV. With Google Play installed you’ll have access to millions of the latest applications, games, and movies – providing you with an unlimited pool of mobile fun and entertainment. The Teclast X80 Plus comes with a 12 months warranty, brought to you by the leader in electronic devices as well as wholesale electronic gadgets..
As a wholesaler, we provide no software support, advice, or training regarding the Android and Windows operating system and software. Any attempts to modify the default OS will void the warranty. Arabic: - الكمبيوتر اللوحي 8 بوصة - Chinese Simplified: - 8 英寸平板电脑 - Czech: - 8palcový Tablet počítač - Danish: - 8-tommer Tablet Computer - Dutch: - 8-inch Tablet PC - French: - 8 pouces Tablet PC - German: - 8-Zoll-Tablet-Computer - Hebrew: - מחשב לוח 8 אינץ - Hindi: - 8-इंच टैबलेट कंप्यूटर - Italian: - 8-inch Tablet Computer - Japanese: - 8 インチ タブレット コンピューター - Korean: - 8 인치 태블릿 컴퓨터 - Malay: - Komputer Tablet 8-inci - Norwegian Bokmål: - 8-tommers tavle-PCen - Romanian: - Calculator tabletă de 8 inch - Russian: - 8-дюймовый планшетный компьютер - Spanish: - 8 pulgadas Tablet PC - Thai: - คอมพิวเตอร์แท็บเล็ต 8 นิ้ว - Turkish: - 8-inç Tablet bilgisayar - Vietnamese: - Máy tính bảng 8 inch.